Chicken chasing is one rather interesting training method that the Washington Redskins will not be asking their 6th Round 2011 NFL Draft, former SMU Mustang Aldrick Robinson pick to participate in during OTAs. The Texas born 5ft 10 inch WR ran an impressive 4.35 40 yard dash at the 2011 NFL combine, and far more impressively just completed a record-setting senior year at SMU, breaking a school record by hauling in 14 touchdowns. Known as a burner in college, Robinson was projected to go anywhere from the second or third round of the NFL draft, so it was with some degree of shock that he fell to the Washington Redskins at pick 178 in the 2011 Draft. NFL FAN IN ENGLAND editor Lawrence Vos caught up with Aldrick just under a week after he was drafted to ask him about being a Washington Redskins player heading into his first season in the NFL. Lawrence Vos (LV): Thanks very much for taking some time out to talk to me. Can you describe in detail the scene, who you were with and what you did the second after you heard you had become a Washington Redskin? Aldrick Robinson (AR): I was with my family sitting on the couch watching the draft, growing impatient because the draft was coming to an end and my name still was on the board. After I found out that I was a Redskin the tension left the room and everybody was excited and jumping around hugging each other. LV: How did you find out you had been selected? and who told you? AR: I received a phone call from the coaching staff right before I was picked and they let me know that I was about to become a member of their team. LV: Which NFL teams had shown interest in you prior to the draft? AR: A lot of teams claimed to have interest in me. Teams like Miami, Chicago, and Carolina showed the most interest but decided not to pull the trigger on me earlier. LV: Did you get calls from any other NFL teams during the draft? If so who spoke to you? AR: I got a call from Miami on the day I got drafted. LV: Coming from Waxahachie,Texas did you grow up a Cowboys fan? If not which NFL did you support growing up and why? AR: I was a Cowboys fans mainly because that’s who everybody around me was rooting for when I was younger. LV: What are your thoughts of now being a Washington Redskins player and what are you looking forward to most? AR: I’m glad the Washington Redskins gave me a chance to take my talents to the next level and I’m looking forward to playing in the NFL. Playing in the NFL has been my goal and Washington has allowed that to happen. I know Washington has the best fans in the league and I’m glad to be a part of that. LV: How frustrating is it that you are unable to get a Redskins WR playbook because of the NFL lockout? AR: It’s very frustrating. I want to make an instant impact for the team and not being able to learn the offense prevents me from doing that. I’m a quick learner but I have a lot to learn before I’m ready to play. LV: As you cannot go and train with the Redskins what are you doing to maintain your fitness during the next month or so? AR: I workout just like I did before the draft. I go to the school (SMU) and do my usual workout so that when the lockout is finally over I’m ready to go right away. LV: How would you best describe your skill set? AR: I’m a guy who has it all, I’m fast, quick, run good routes, and have good hands. LV: You scored some crazy long touchdowns as an SMU Mustang (a 96 yard td tying a school record in 2009 and 94 yards in 2008). Can you talk me through either or both of them please? AR: Both of those extremely long touchdowns where on the same route, a deep post. I just got behind the defense and the quarterback threw it up and we made history. 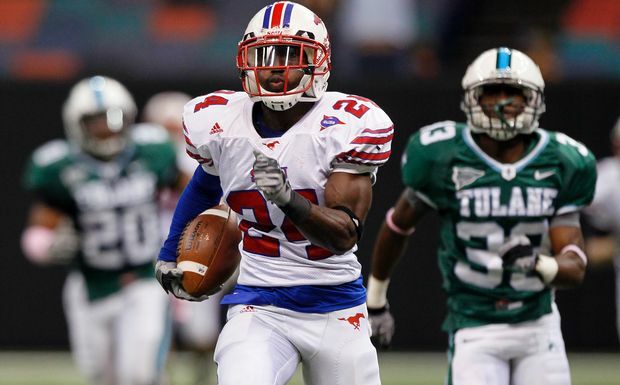 LV: The last SMU WR to be drafted was Emmanuel Sanders, who came back to Texas to play in Super Bowl XLV as a rookie. 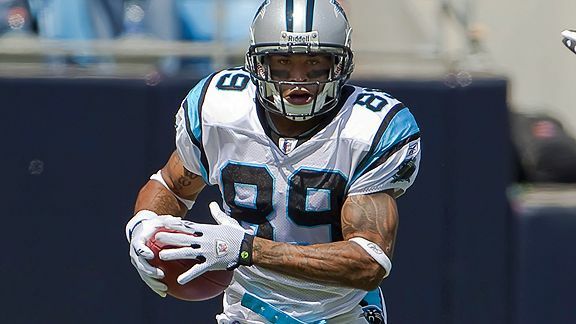 Where were you to watch Sanders get his two catches in that game and what was going through your mind to watch a former team-mate in the most watched event ever? Have you spoke to Emmanuel about what to expect in the NFL? AR: I was in Florida training for the combine and we all went to Beef O Brady’s to watch the game. When he caught those passes I was happy for him because I knew he was living the dream. When I talk to him about the league he tells me how demanding the next level will be and that you get from it what you put in it. He made the transition look easy and I plan to do the same thing. Aldrick's former SMU team-mate Emmanuel Sanders played in the Super Bowl earlier this year - seen her making one of two catches in the game. LV: I know most players say their target is to ‘be the best player that they can’ but do you have any real statistical targets as a Redskins rookie? AR: I haven’t set my goals for my rookie season just yet but I do know that I will make an impact for the team in a big way. LV: You returned a few kickoffs as a Mustang. Is being part of the Redskins return game something you would like to push for a place in and why? AR: I think it would be a way for me to bring something else besides being a receiver to the table. They say the more you do the longer you stay so I’m trying to do it all. LV: Here in England our most extensive NFL coverage is on Sky Sports. One of our regular guests has been Coach Jeff Reinebold. How has Coach Reinebold helped you to develop into an NFL athlete? AR: Jeff does a good job making a man out of a player. From the way he treats you on the field to the meeting room makes you feel like a man. He can be hard at times but that’s what you want as a player sometimes. He’s always willing to help you out and he actually cares about his players as people rather than just players. LV: Also how has Coach June Jones helped you develop? LV: Coach Jones knows the game of football inside out and when it comes to dissecting a defense he knows exactly how to do it. In the NFL reading defenses is the only way a receiver will consistently get open and being under June Jones helped me learn how every defense works. LV: You come from a College that helped shape some outstanding NFL athletes, including Eric Dickerson, Forest Gregg and WR Raymond Berry. In what way do you want people to describe the legacy that you left SMU? – 181 catches 3314 yards and 30 touchdowns is some feat. AR: I want to go down as a guy who made big plays. I contributed to the turning around of the program and put up some big numbers. So I think when people look back at my college career they won’t have anything bad to say. LV: I cannot go any further without asking what you think will happen with the quarterback situation at the Redskins? AR: Well I have no idea how its’ going to unravel with the quarterback situation but I do know the coaches will make a great decision on whoever they decide to roll with. LV: Did you know the last time the Redskins drafted an SMU WR they were called an ‘End’ – it was 1952 and the player was called Ben White. He was selected in the 27th round but unfortunately he didn’t make the team. How determined are you to be on the Week 1 roster suited up and playing against the Giants on September 11? AR: I’m very determined because I’m not just in the NFL to be in the NFL. I want to make plays and make a name for myself and to do that I have to suit up and be on the active roster. This is going to be interesting how me and the other receivers respond to being the first group of SMU receivers drafted in decades. LV: Tell me something about you that you have not told any other journalist – this can be as fun as you like? AR: I have a fiancé and I plan on getting married this summer. LV: Congratulations to you and your bride to be. Sep 26 2011 – Redskins at the Cowboys – what are your thoughts knowing that you could be playing against the Cowboys as a Redskin player in under five months time? AR: That’s going to exciting because I’m going to be back at home playing the home team. My whole family will be in attendance so it’s going to be like a homecoming for me. LV: What is your favourite snack? AR: I like eating fruit roll ups. I could probably go through a whole pack in one day. LV: Which NFL player do you compare yourself to and why? AR: I would say I play like Steve Smith. We both are considered undersized receivers but we make big plays. As a small bonus I also spoke to Aldrick’s position coach at SMU, Coach Jeff Reinebold, to ask him his opinion on seeing one of his WRs get drafted for the second year in a row. Said Coach Reinebold: “Any time you have a player drafted in the NFL it is a big thing. Al grew so much as a player and as a person in his time at SMU. “Like Emmanuel Sanders before him (drafted by the Pittsburgh Steelers in 2010) Al has worked hard to transform his god given ability into an NFL ready wide receiver. Interview took place on 6 May 2011.